Well, he said it and then, just to make sure we got the point, he tweeted it: "I've been wondering what that special place in hell looks like, for those who promoted Brexit, without even a sketch of a plan how to carry it out safely". Whatever else, Mr Tusk's remark was not off-the-cuff. This had the hallmark of a deliberate, premeditated comment coming as it did at the end of a prepared statement after his meeting with Taoiseach Leo Varadkar. The full statement itself is worth noting. Not a word is wasted. "There are 50 days left until the UK's exit from the European Union, following the decision and the will of the UK authorities", Tusk said. "I know that still a very great number of people in the UK, and on the continent, as well as in Ireland, wish for a reversal of this decision". But, he said, "I have always been with you, with all my heart. But the facts are unmistakable. At the moment, the pro-Brexit stance of the UK Prime Minister, and the Leader of the Opposition, rules out this question. Today, there is no political force and no effective leadership for remain. I say this without satisfaction, but you can't argue with the facts". 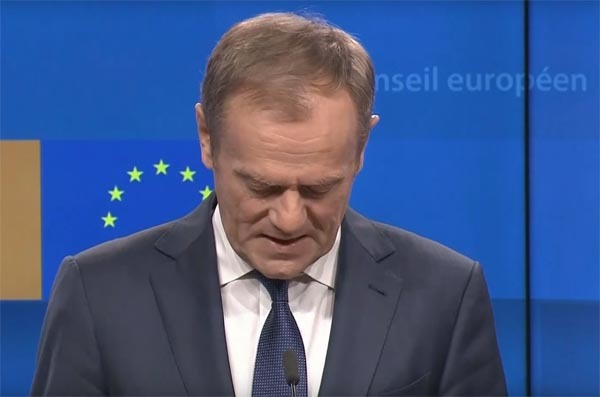 And then came the key part: "Today our most important task is to prevent a no deal scenario", Tusk said, stressing that the position of the EU27 was clear. They were not going to make any new offer. "Let me recall", he said, "that the December European Council decided that the Withdrawal Agreement is not open for re-negotiation". With that, he hoped today to hear from Mrs May "a realistic suggestion on how to end the impasse, in which the process of the orderly withdrawal of the UK from the EU has found itself, following the latest votes in the House of Commons". The top priority for the EU, according to Tusk, "remained the issue of the border on the island of Ireland, and the guarantee to maintain the peace process in accordance with the Good Friday Agreement". There was no room for speculation, Tusk said. "The EU itself is first and foremost a peace project. We will not gamble with peace; or put a sell-by date on reconciliation. And this is why we insist on the backstop". In what amounted to a direct warning to Mrs May, he then said, "Give us a believable guarantee for peace in Northern Ireland, and the UK will leave the EU as a trusted friend". "I hope", he said, "that the UK government will present ideas that will both respect this point of view and, at the same time, command a stable and clear majority in the House of Commons. I strongly believe that a common solution is possible, and I will do everything in my power to find it". Coming to a conclusion, he then delivered a further warning: "A sense of responsibility", he said, "also tells us to prepare for a possible fiasco". And at that point came the "plan" comment. Clearly, this was an intended remark. Needless to say, this has provoked a storm of protest, not least from Andrea Leadsom, who thought Mr Tusk an "EU Commissioner". It showed, she said, that he had no manners, the "sign of a charming fellow". Health secretary, Matt Hancock, said: "It's this sort of arrogance that drives antipathy towards the EU. We are a country that upholds the result of democratic votes. Our EU partners need to respect that", and home secretary, Sajid Javid – he who wants more "goodwill", tweeted that Tusk's remarks were "out of order". Arlene Foster, DUP, condemned Tusk for being "deliberately provocative [and] very disrespectful", while Sammy Wilson described him as a "devilish Euro-maniac". And, in the House of Commons, Peter Bone complained about what he described as a "completely outrageous" insult. "I don't recall any president insulting members of this House, members of the government and the British people in such a way", he said. Of course, what really must hurt is the simple fact that Tusk is right. In the first place, we had the leave campaign refuse to commit to an exit plan and then, after the event, Mrs May launched the Article 50 process without the first idea of where it was going to take us. Through the entire process, she has been a study in negativity, knowing what she didn't want, but failing at any time to express to the EU precisely what she did want. And now, at the eleventh hour, she comes to Brussels, as Sinn Féin's Mary Lou McDonald puts it, "with no plan, no credibility and no honour". As for those who deserve those reserved places in hell, Verhofstadt seems to have a different view. "I doubt Lucifer would welcome them", he said, "because according to what they did to Britain, they might even be able to split hell". Nevertheless, I wrote about this only a little while back. In the number one spot, I would put Nigel Farage, followed by Lord Lawson and his colleagues in the IEA, and then Dominic Cummings and his vile crew in Vote Leave. Only then would I open the gate for Mrs May, but Jeremy Corbyn, as leader of the opposition, also gets a slot. But for all that, dwelling on this isn't going to get us very far. One wonders what Donald Tusk expected to achieve by his remark. The Guardian's John Crace picks up the exchange between Leo Varadkar and Tusk after the fateful words had been delivered. "They'll give you a terrible time in the British press for that", Varadkar whispered. Tusk merely smiled: "Yes, I know. Hahaha". According to Crace, he no longer cared that much what anyone thought. He had tried to be nice to the Brits "but all you got in return was news bulletins with Theresa May in a Spitfire and people comparing the EU's aims with Hitler". And there may be an element of truth there. If this is taken as a signal, it says that the EU has virtually given up hope of achieving anything from Mrs May's visit, and they don't care who knows it. They've gone through the hoops – to hell and back, even – and now it is just a question of going through the rituals once more, Frankly, if they have reached even a fraction of my level of boredom, then I'm surprised they've stayed the course this far. Furthermore, while the focus is on Tusk, he is by no means alone: yesterday the EU was doing things in stereo, with Leo Varadkar also meeting Jean-Claude Juncker, from which a joint statement emerged. In this case as well, no one could accuse the pair of beating about the bush. "The Withdrawal Agreement and the Political Declaration have been negotiated in good faith and have been agreed by all 27 Leaders of the European Union Member States as well as by the United Kingdom Government", they said, adding, "As we have said on many occasions, the Withdrawal Agreement is the best and only deal possible. It is not open for renegotiation". Reiterating that the backstop was an integral part of the Withdrawal Agreement, they reminded us that the agreement, including the backstop, was "a balanced compromise" and "not a bilateral issue". This was a European issue: "Ireland's border is also the border of the European Union and its market is part of the Single Market. We will stay united on this matter", they said. As with Tusk, there was a reference to stepping up preparations for a no-deal scenario, leaving the UK in no doubt that there was a limit to how far the EU is prepared to go. Fortunately for Mrs May, Brussels officials are stressing that Mr Tusk's remarks about special places in hell only apply to the relevant personnel when they are dead and "not right now". That leaves Mrs May free to respond when she arrives in Brussels. Early comment from Number 10 is telling us that Mrs May will ask representatives of the EU institutions to work "urgently" with her to secure changes to the withdrawal agreement that she can use to win over fractious Conservative Party members as well as MPs across parliament. She will acknowledge that the agreement "was the product of much hard work and was negotiated in good faith", but will add that Westminster had sent "an unequivocal message that change is required". It was thus for everyone involved to "show determination and do what it takes to now get the deal over the line". The trouble is that Mr Tusk had already given his response before these words were even uttered, leaving the media geniuses to speculate that the chances of a breakthrough "are not good". What would we do without these sages?